SAN FRANCISCO -- Remember the Unicorn Frappuccino? 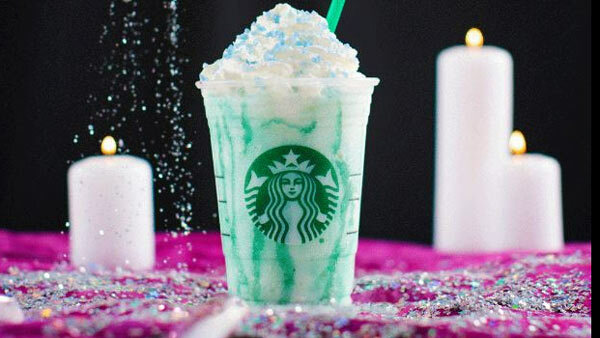 If you like those over-the-top Starbucks drinks, get ready for the "Crystal Ball" concoction. Starbucks posted an image of the drink on Thursday. "It starts with a creme-based Frappuccino infused with peach flavor and turquoise sparkles that create an enchanting marbling effect," Starbucks says. They continue, "The magic happens when the peach-flavored whipped cream is sprinkled with one of three colored candy gems, each color signifying a different fortune in vivid blue, green and purple. Only the fates can decide which color is revealed - the customer will not know which color of candy gem will top the beverage." A Starbucks in northeast Portland shared a picture of the new drink on its Instagram page. The "divine treat" will be available March 22 to 26, while supplies last in participating Starbucks stores in the United States, Canada and Mexico.